« It’s the first post of 2013. Merry Christmas. After staying up the other night in a sleep-deprived haze to write an incredibly long story in order to move into Dinosaur Dracula’s Luxury Apartments, it hit me how much I miss writing. More importantly, how much I miss writing this blog, so I decided to fire off a quick one tonight to try to get back into the habit again. Every six months or so I’ll get a spurt of inspiration and get energized about writing. I’ll fire off one or two posts, then you won’t hear from me again for a while. I’m going to try to not let that happen again, but if there’s one thing I’ve learned, it’s not to make any promises. But for now, here I am, at 2:20am, doing this. My dad sets up at the flea market almost every Saturday. I try to go with him when I can and help out and it’s a pretty good time, despite the fact that you have to be out there on a Saturday morning at eight damn o’clock morning. If there is one thing I am not, it’s a morning person. But, we have a good time and he makes a little money, which means, if I’m lucky, I make a little money too. Occasionally, I’ll leave the table and go look at the other vendors and check out what’s what. I’m tempted to make this post about the flea market experience and the rare breed of folks that show up every Saturday morning, but trust me, that’s a whole other post altogether. 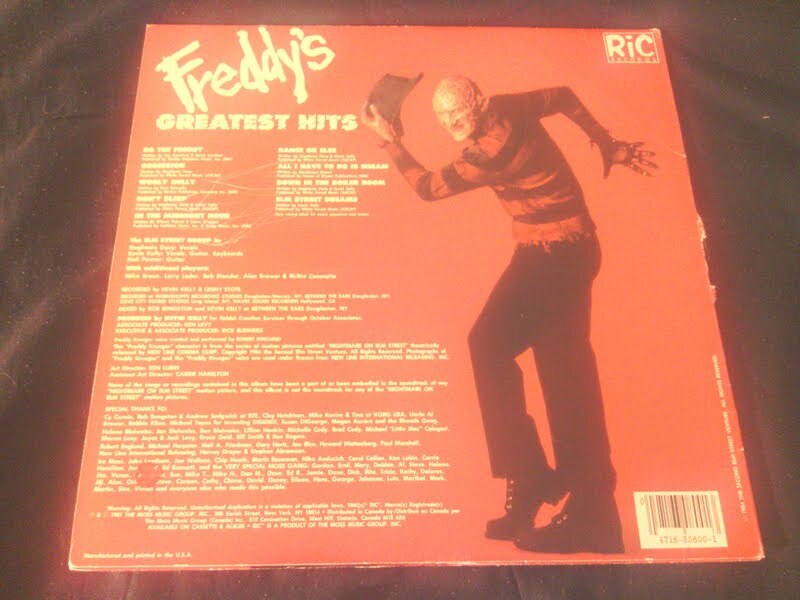 Nope, this post is about how I scored FREDDY’S GREATEST HITS. Matt’s written about this on more than one occasion, but I first found out about it while scouring the vinyl selection in the library at the studio where I do my radio show. For years, I’ve been a huge fan of the album and have been playing selections from it on the show, but never thought I’d ever actually own a copy. I promptly said to the guy, “I will take that right now”, without even asking how much it was. I was thinking I could live with myself by paying $20, so when he suggested $10, I said, “Yeah, that was pretty much what I was thinking too”. Sucker. 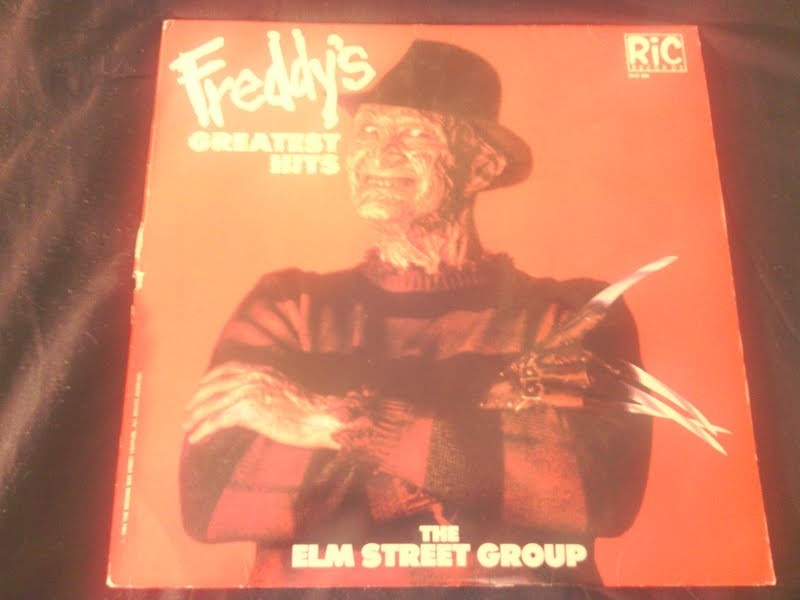 For those of you who aren’t aware, the record is by a group of session musicians called The Elm Street Group and mostly contains covers of old songs as well as a few originals. All incorporate Freddy, sometimes singing and sometimes laughing his way through the song. For me, the standout tracks include “Do The Freddy” and “Obsession”. “Do The Freddy” is a fun, stupid little thing and I used to play it on my show for the sole purpose of torturing my listeners. However, “Obsession” is one that I actually like. I mean, in a completely unironic, genuine way. Check it out for yourself. Oh, and here’s the back of the record if you’re interested. Looks like Freddy himself scratched the hell out of it. Oh, and forgive the washed out, low quality of the pics. I probably should have used my other camera instead of the one on the phone. For once, walking around in a sleep-deprived haze and hanging out with Freddy worked out. I should do it more often. Now if I can just figure out what’s up with this red tricycle that keeps rolling around here. I’m sure it’s nothing I should worry about, right? This entry was posted on May 6, 2013 at 3:51 am and is filed under Uncategorized. You can follow any responses to this entry through the RSS 2.0 feed. You can leave a response, or trackback from your own site. Good find, Deej. I still have trouble willingly bringing myself to watch, listen, look at or read Freddy related stuff, but I can totally get behind the album after hearing bits of it over the years. If you haven’t got it, I’d also recommend the Tales From The Crypt christmas album. That’s a thing? I’ve got to find this!